RC2 Corporation (RCRC), a leading designer, producer and marketer of high-quality toys as well as infant and toddler products, is slated to release its second-quarter 2010 earnings on Tuesday, July 20. The current Zacks Consensus Estimate for the second quarter is 15 cents per share, representing annualized growth rate of (19.1%). RC2 has outperformed the Zacks Consensus Estimate over the trailing four quarters, with the earnings surprises varying in the range of around 15.4% to 58.3%. The average earnings surprise was 22.2%. 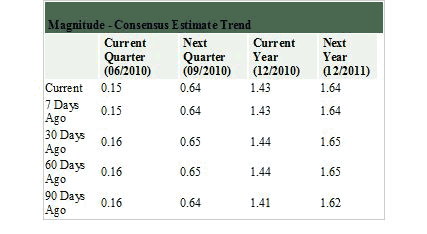 This implies that the company has beaten the Zacks Consensus Estimate by this magnitude over the last four quarters. RC2 reported first-quarter 2010 earnings of 15 cents per share, which was ahead of 10 cents per share reported in the year-earlier quarter, driven by lower input cost and higher margins, but missed the Zacks Consensus Estimate by a penny. Net sales increased 2.1% year over year to $88.1 million implying an improving trend in consumer spending pattern. Sales benefited by 4% due to favorable fluctuations in foreign currency exchange rates. RC2 reported a gross margin of 44.0% compared with 40.2% in the prior-year quarter. The improvement was primarily driven by a more favorable product mix, lower input costs and favorable foreign currency exchange rates. For the second quarter of 2010, the company expects overall net sales and profits to be lower than the year-ago quarteras a result of the transition in its preschool, youth and adult products category. RC2 will stop selling the Take Along Thomas & Friends die-cast product line due to the non-renewal of license while a number of new preschool product lines will be launched only in the second half of the year. However, RC2 management remains optimistic on its Mother, Infant & Toddler (MIT) segment. For full-year 2010, RC2 reaffirmed its earnings guidance of $1.35 to $1.45 per share. Management also expects input costs to scale up in 2010. Estimates for the coming two quarters and fiscal years have moved down in the last 30 days, implying that the analysts are less optimistic on the stock. Let’s dig into the details. In the last 30 days, out of 8 analysts covering the stock, 2 analysts lowered their second quarter estimates while none went for any increment, thus providing a downward directional movement. Estimates for fiscal 2010 and 2011 were slashed by 2 analysts while none increased the same. The analysts reduced the estimates primarily based on the loss of the Thomas & Friends die-cast license, high levels of cost escalation for labor and key raw materials, management’s expectation of a slight decline in gross margin, weakening Euro and slowing overseas growth. Additionally, wage inflation in China and the uncertainty over the renewal of Thomas Wooden license, which is to expire at the end of 2012, also remain concerns for RC2. However, a group of analysts also believes that the price rise implemented in a variety of product categories will be an offsetting factor in 2010. Estimates have not budged over the last 7 days, implying that the analysts do not see any meaningful catalyst for the time being. Over the past 30 days, all of RC2’s estimates for coming two quarters as well as fiscal 2010 and fiscal 2011 were trimmed by a penny. Currently the Zacks Consensus Estimates for the second quarter, fiscal 2010 and 2011 are a respective 15 cents, $1.43 and $1.64 per share. Estimates for 2010 and 2011 reflect year-over-year growth of (2.8%) and 14.5%, respectively. We expect RC2 to benefit from its aggressive acquisition strategy and the cost-reduction initiatives, which are likely to drive its margins going forward. Given the demographic trends, RC2’s focus on MIT segment also bodes well. Considering the company’s product line-up in the second half of 2010, we expect an improvement in the top line. However, the loss of the Thomas & Friends license to Fisher-Price will likely prove to be a significant challenge in the near term and is expected to have curtailed sales and profit in the second quarter. Additionally, like all retail companies, RC2 also remains vulnerable to economic uncertainty, and input cost pressure. Hence, we maintain a Neutral recommendation on the stock. One of RC2’s primary competitors Mattel Inc. (MAT) reported its second quarter 2010 earnings today at 14 cents, which missed the Zacks Consensus Estimates by a penny. RC2’s other peers Hasbro Inc. (HAS) and JAKKS Pacific Inc. (JAKK) are slated to release their second quarter 2010 earnings on July 19 and July 26, respectively. We currently have a short-tem Sell rating on RC2.